The sensation of dizziness. An instance of such a sensation. A confused, disoriented state of mind. You can download a clip of the mp3 courtesy of links posted by the bands own website here or go to iTunes for the full version. 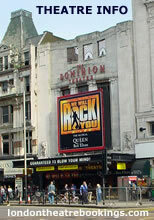 Went to see we will rock you last night and it was very good. It was also very loud, in fact it was just like being at a rock concert. I have to give say that Ben Elton is quite clever the way he spun a story out of Queen's greatest hits setting it in a future where there is no original music and no instruments to make any with. What amazed me was that Bohemian Rhapsody was released in 1975 according to the listing of rock songs at the start (beginning of course with the fab 4) makes me feel old to think that this song is now nearly thirty years old. Plenty of good gags and shades of Rocky Horror in the storyline as well. London is incredibly crowded at the moment with the streets full of people and busier than Bintang walk ! Okay as long as I can get a break from it every couple of hours. Like I said yesterday I am not a true cosmopolitan. We got our first look at our youngest member of BLC yesterday. I have never seen a happier Mum than Gabriel's or a more contented Dad. Gabriel is also a song title by an irish musician who goes by the name of Luka Bloom I was told he wrote it for the birth of his son. Either way it is a beautiful song and dedicated here to a beautiful baby boy.